For more information email the Chamber chamber@amarillo-chamber.org or contact one of the certified agents below. 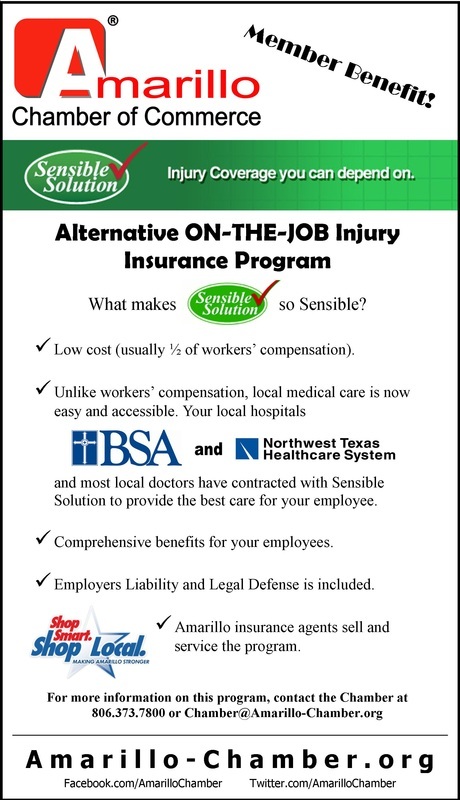 The Amarillo Chamber of Commerce has a partnership with Jackson-Lloyd Insurance Management to provide “Amarillo’s Sensible Solution”, an insurance choice for workplace related injuries with lower premium payments as well as a vehicle for controlling claims costs. This plan has been developed to protect the business interests of the membership by providing real insurance protection in an affordable way. Amarillo’s Sensible Solution offers three different policies available to chamber members. Each policy contains different pricing levels to fit any budget, thereby enabling not only large employers but small employers the ability to choose their desired level of coverage for on-the-job injuries. Business members can be assured that their employee injury claims will be treated by Amarillo hospitals and doctors with quality care that each employee deserves. Amarillo’s Sensible Solution is a timely insurance product that will give our business members a real advantage in a rocky economy. This new product will empower our members with a superior, low cost product utilizing a fresh, alternative approach and keeps our healthcare treatment at home, providing quality care and convenience for injured workers. Amarillo’s Sensible Solution is an answer to employers who have elected to forgo work place injury insurance and may face financial disaster if a work-related catastrophe results in death or serious injury to employee(s). All three policies available are comprehensive plans providing non-subscribers with protection from the financial worries of an on-the-job injury. These plans are affordable and offer benefits for covered losses that include bodily injury, occupational sickness or disease, cumulative trauma and Employers Liability Coverage. Amarillo Sensible Solution is underwritten by a nationally prominent insurance company rated “Superior” (A+XV) as assigned by A.M.Best. Development of Amarillo’s Sensible Solution has been a team effort of the Amarillo Chamber of Commerce, Jackson-Lloyd Insurance Management and the agency service team plus healthcare providers of the Amarillo area. BSA Hospital and Northwest Texas Healthcare System support this concept of occupational healthcare. Chamber member business owners can be assured that their employee injury claims will be treated by Amarillo hospitals and doctors.